This Mother’s Day I’m not writing about my own mother. Instead I’m writing about the mother of a writer friend of mine. Coming to America: A Girl Struggles to Find Her Way in the New World, written by Diana Erbio, is the story of Rosalie, a young teenager who moves with her parents and older brother from Switzerland to New York City in 1949. 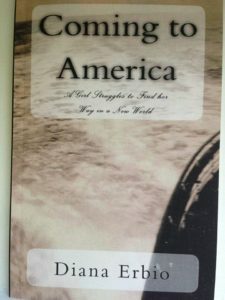 The action begins during the voyage across the ocean and ends on a positive note more than a year after Rosalie’s arrival in the U. S.
The story is from Rosalie’s point of view. It takes the reader through her emotional adjustment and as well as adjusting to city life. The story shows Rosalie’s resilience, and it shows her starting to bloom in her new home. The story touches on some of what Rosalie’s parents and brother are dealing with, too. Her father, an American, is thrilled to be back in America. Her mother deeply misses Switzerland, and her brother is finding his own way like Rosalie is. Coming to America reminds me of the Dear America book series, except that Coming to America is a true story whereas the Dear America books are historical fiction. This is a worthwhile read for anyone older elementary and up, including seasoned adults. It is also an excellent family read-aloud. I homeschooled my children, and if I was still homeschooling this book would be on my kids’ reading list. Click here to go to Diana Erbio’s facebook page.